The Army Corps of Engineers is no longer allowing commercial moorings inside of the Federal Navigation Project, the large rectangular area shown on this map. This decision is causing commercial entities such as Front Street Shipyard to scramble to find enough moorings in Belfast Harbor. BELFAST, Maine — City councilors waded into the murky waters of debate Tuesday night over how to manage commercial vessel moorings in Belfast Harbor. Demand has been growing for mooring slots in the inner harbor in recent years, especially among commercial users, Belfast Harbor Master Kathy Pickering told councilors. That demand has become acute this year because the Army Corps of Engineers told the city it no longer would allow commercial entities to manage moorings within the federal navigation project area. Because the Army Corps of Engineers has used public money in the past to dredge the navigation channel and the area around it, they do not allow private entities to profit from activity inside that area, which encompasses most of Belfast Harbor. No one is mooring boats in the harbor at the moment, but the season will begin in a few weeks. The Army Corps does not allow any boats to moor in the navigation channel but will continue to allow recreational boats to moor inside the area designated as the Federal Navigation Project. Because of the Army Corps’ decision, there is plenty of room in the harbor for recreational boaters. But commercial entities, including the Front Street Shipyard and the Belmont Boatworks, are scrambling to find enough space for their moorings. According to Slocum, Front Street Shipyard had 18 moorings and Belmont Boatworks had one commercial mooring and two recreational moorings within the Federal Navigation Project. Making matters more complicated is the fact that Front Street Shipyard won a $50,000 grant to upgrade its 18 moorings inside the harbor, and company officials told Slocum they have learned they risk losing the entire grant if they can’t get find a new home for the moorings by June 1. The Belfast Harbor Committee held a special meeting last week to come up with a plan to resolve the situation by finding commercial mooring sites outside the navigation project zone. According to that plan, Front Street Shipyard would be given five moorings in a preferred location closer to the breakwater, and the rest would be in the outer edge of the harbor. Meanwhile, the committee recommended giving Belmont Boatworks three preferred moorings close to the breakwater. “I’m having a real problem understanding the harbor committee’s decision,” Councilor Mary Mortier said. 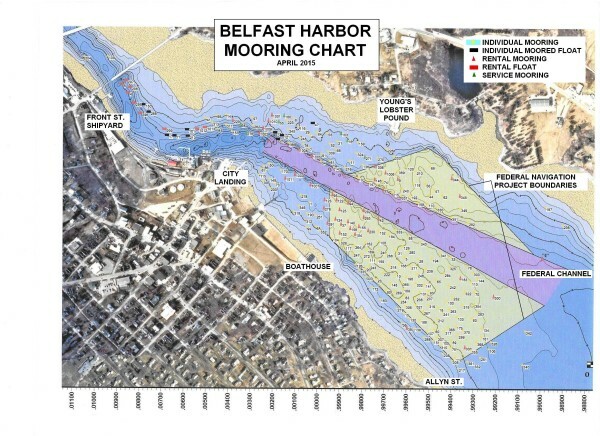 Councilors decided to go in a different direction than the harbor committee’s recommendation and discussed asking owners of recreational moorings outside the navigational zone if they would consider switching their moorings with the commercial entities — at Front Street Shipyard’s or Belmont Boatworks’ expense. Slocum said, as the harbor committee continues to try to sort out the issue, it’s possible the recreational boaters will need to move their moorings one day anyway and suggested having the city write the letter to those boaters. Another suggestion was for Front Street Shipyard and Belmont Boatworks to approach the recreational boaters themselves. “If it’s a city letter, it suggests there’s a policy in place,” Councilor John Arrison said. Slocum said the city can write a letter letting people know they’re trying to help. “I think people do need to know that, no matter what happens, there’s going to be a plan someday,” he said. J.B. Turner of Front Street Shipyard said he would like the city to write the letter, adding that if he and Dan Miller of Belmont Boatworks vied for moorings it could get adversarial. In the end, the majority of councilors voted to approve the harbor master’s request to switch 18 commercial mooring permits for Front Street Shipyard from within the Federal Navigation Project area to outside it. They also approved the request to have Slocum draft a letter to recreational boaters explaining what’s going on and asking them to consider switching their mooring permits with Front Street and Belmont. Arrison cast the only opposing vote. Correction: This article has been corrected to show that Belfast City Manager said the Army Corps of Engineers’ decision had put Belfast “in a pickle.” An earlier version erroneously indicated Belfast Harbor Master Kathy Pickering said this.